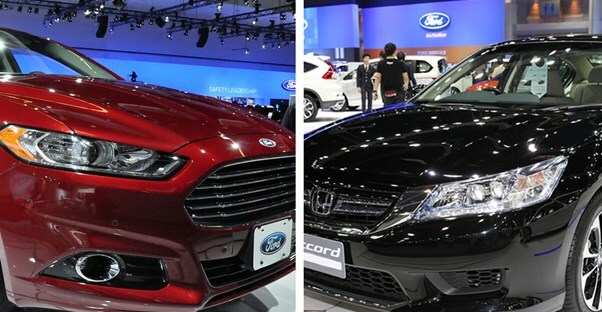 The Ford Fusion and Honda Accord are two great sedans for people who care about safety but don't want a giant vehicle. You can fit five passengers or everything you need for a weekend getaway. It can be hard to choose which car is perfect for you, but this breakdown may make it a bit easier. No one wants to overpay for their next car, so the price is often one of the most important aspects of a vehicle. In this case, the 2017 Ford Fusion S is the cheaper option with a starting MSRP of $21,995, according to Ford. The 2017 Honda Accord LX has a starting MSRP of $22,335, according to Honda. The vehicles have a $340 price difference, which isn't nothing, but probably won't make a huge difference on a monthly payment. Most people also want a car that gets great gas mileage. We don’t want to spend too much time (or money) at the pump! Better fuel economy means you’ll spend less money in the long run, and the Honda Accord certainly has better mileage per gallon. The 2017 Ford Fusion has an estimated fuel economy of 22 mpg in the city and 34 mpg on the highway. However, the Honda is equipped with a base four-cylinder engine and CVT, which gives it strong performance and great mileage. The 2017 Honda Accord can get an estimated 27 mpg in the city and 36 mpg on the highway. This can be remarkable for anyone to spends most of their time driving around town. Safety is critical, and you may be willing to pay extra for a vehicle that will keep the driver safe at all times. The Ford Fusion comes standard with antilock disc brakes, traction and stability control, front-seat side airbags, front knee airbags and side curtain airbags. The Ford Sync system also includes an emergency crash-notification feature that auto dials 911 when paired with a compatible cell phone. There aren't a ton of cutting-edge safety features that comes standard, but the government has still awarded the Fusion five out of five stars for overall crash protection. The Accord comes with antilock disc brakes, stability and traction control, active front head restraints, front-seat side airbags and side curtain airbags. In addition to these safety features, the Accord also comes with a standard rearview camera. You can upgrade to the Honda Sensing package at an extra cost to get more safety features like lane departure warnings and adaptive cruise control. Overall, government crash tests gave the 2017 Honda Accord a five out of five stars. No one wants to purchase a vehicle every few years because their new one had engine or transmission issues. Overall, both vehicles have the same J.D. Power Rating score for reliability at 3.5. However, the Honda Accord stands out mechanically with a 3.5 powertrain quality, 3.0 body and interior quality, and a 4.5 features and accessories quality. The Ford Fusion, while it has the same score, it only received a 3.0 on powertrain and interior quality. Features and accessories quality received a 4.5 total score. Ford New Models: What’s Changed?